The Nigerian Police, Monday arrested the most notorious and wanted suspect, Ikechukwu Udensi alias Ikanda. Ikanda was said to have murdered one Ndubisi Nwokolo, on the 29th of June 2018. He has been accused of various armed robbery attack and related crimes in the state. Report has it that the Anambra state government had placed a one million naira bounty on his head for anyone with useful information about him. Unfortunately for him, he was arrested by the police today. 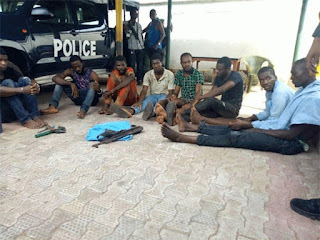 Confirming the incident while addressing journalists, the Anambra State Commissioner of Police, Mustapha Danduara, said the command will not relent in its war against crimes, especially cultism. He was paraded alongside other six suspects for various criminal offences including attack on Ajali police station and armed robbery.